Whatever your New Year’s Eve plans are, they almost certainly pale in comparison to what British artist Benjamin Waterhouse Hawkins was doing on December 31, 1853. 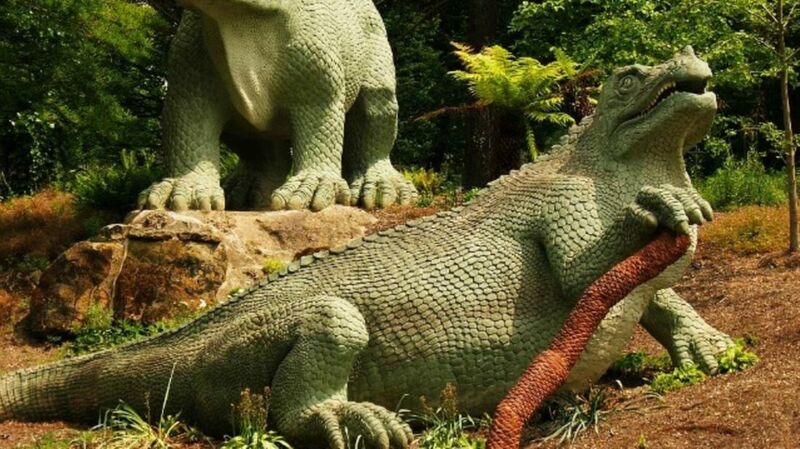 The previous year, Hawkins, a sculptor and natural history artist, had been asked to create a series of sculptures of "antediluvian monsters" for the area surrounding the Crystal Palace in London, after it moved from Hyde Park to Sydenham Hill. Working under the guidance of celebrated paleontologist Richard Owen, Hawkins decided to construct dinosaurs from the Paleozoic, Mesozoic, and Cenozoic eras, among other creatures. The menu was quite elaborate: three soups, three types of fish, at least seven meats, a veritable buffet of sweets and desserts, and several kinds of wine. Owen gave a brief presentation about the sculptures over dinner, and Hawkins later reported that the boisterous crowd stayed late enough to ring in the new year. “The roaring chorus was so fierce and enthusiastic as almost to lead to the belief that the herd of lguanodons were bellowing," he wrote. Collection 803. Benjamin Waterhouse Hawkins Album. Academy of Natural Sciences of Philadelphia.